How old must this recipe be? I think we've all had it growing up because it was both economical and delicious. It's versatile too because you can add different things to it. Sometimes I boil some eggs and chop them up in this salad for a different taste. I have added a little cheddar cheese at times. I've served it warm and chilled. But this one I kept pretty basic and for lunch today I'm am having it with some buttery club crackers. So good. Cook pasta in boiling salted water until al dente. Drain. 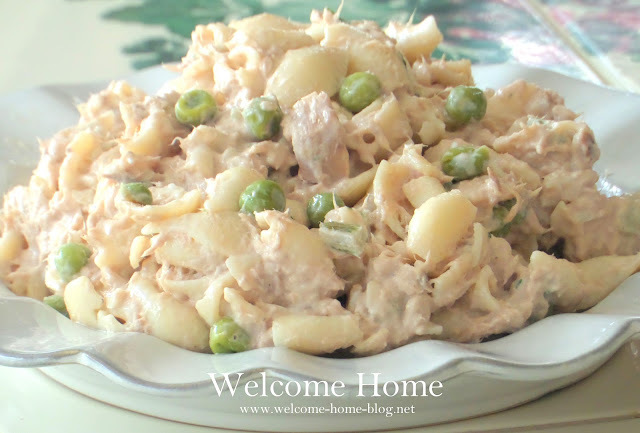 In a large bowl place the sliced onions, celery, peas, drained pasta, and drained tuna. In a separate bowl, mix the mayo and dill weed. Stir into pasta mixture. Serve warm or chilled. Optional ingredients: Chopped hard boiled eggs, shredded or cubed cheddar cheese, green pepper, tomatoes, etc.